The Maps app on your iPhone is very handy for many reasons. Among other features, you can go to another location to find directions or nearby places and go to Favorites. 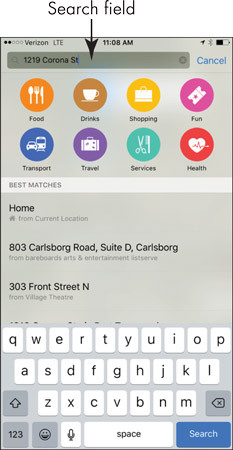 With Maps open, tap in the Search field; the keyboard opens. If you have displayed directions for a route, you won’t see the Search field in the top of the screen; you may have to tap the Clear button on a directions screen to get back to the Search field. Type a location, using a street address with city and state, a stored contact name, or a destination such as Empire State Building or Detroit airport. Maps may make suggestions as you type if it finds any logical matches. Tap the result you prefer. The location appears with a red pin inserted in it and an information bar with the location name with a Directions button to the left and an arrow to the right. Tap the arrow, and more information is displayed. In some cases, the Street View icon is also displayed. Note that if several locations match your search term, several pins may be displayed in a suggestions list. When you start a search, icons for nearby businesses appear. This Nearby feature is new in iOS 9. Tap Map in the top-left corner, and you move back to the map where you can tap the screen and drag in any direction to move to a nearby location. Tap the Share button (the symbol to the right of the Search field), and then tap Add to Favorites. Tap Save in the screen that appears (modifying the location name first, if you like), and the location is saved to Favorites. Now when you tap in the Maps Search field, Favorites is the first result. Tap on Favorites to view and go to a favorite site. To delete a location from Favorites, with Favorites displayed tap Edit, tap the red circle to the left of any item, and then tap Delete. You can use the new 3D Touch feature with an iPhone 6s or 6s Plus to preview the map associated with a location. For example, if there is an address noted in an iMessage text, you can press it with medium force and preview the map of that location or press it harder to display the map.